It’s often hard to know what to make of almost anything we see in the world at large. Garry Winogrand, with whom I daily walked the streets of Manhattan, LA, Paris, and elsewhere for a few steady years in the mid 60’s, used to say that when he photographed someone on the street with their mouth wide open it was difficult to know if they were screaming, laughing or yawning, and it was that ambiguity that made it an interesting photographic moment. Here too, the ridiculous angle and action opens the frame to suggestions of a violent nature, as well as just thoughtless family teasing. These unknowns are part of the photographer’s vocabulary of ‘signs,’ which indicate something of interest is happening right here! But will it yield a photograph? Only the photograph after the fact will tell us if it amounts to more than the sum of its parts. 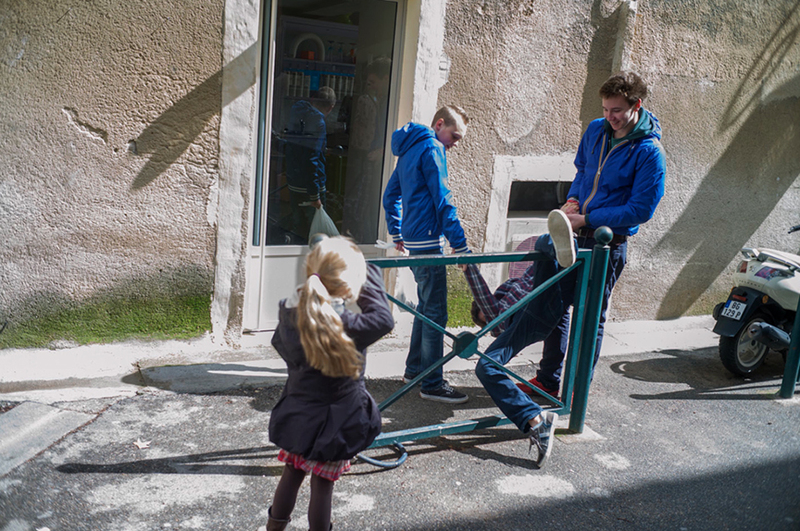 This entry was posted in Family Life and tagged France, Kids, small town, street on April 5, 2015 by joelmeyerowitz2014. To me a photo is interesting if it has signs that suggest something yet it’s open for more than just one interpretation. At that point the viewer sets their mind to work and starts asking questions. If the photo doesn’t generate this kind of response, it can be boring.